Manufacturer of a wide range of products which include gravity conveyors, motorized roller conveyor and powered roller conveyors. 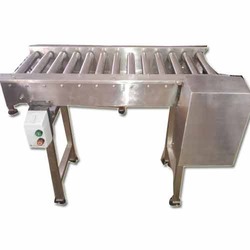 We bring forth a wide range of Gravity Conveyors that is highly demanded by the clients for its fine performance and durability. Our range is available in precise lengths and dimensions suiting the needs and demands of the clients. It is use to transport the materials easily and saves labor, energy and time. Moreover, we assure that quality tested range is delivered from our end that can be availed at the most industry leading prices. Matching with the requirements of the clients, we manufacture and supply a wide array of Motorised Roller Conveyors which are suitable for bearing heavy loads. Easy to install and operate, our range of Motorised Roller Conveyor has become the favored choice of clients. Precisely manufactured, our range is made available in the market at cost effective prices. We are Supply Various Grades of Materil SS316, SS316L, SS304, SS202, Mild Steel With Powder Coated. Matching with the requirements of the clients, we manufacture and supply a wide array of Powered Roller Conveyors which are suitable for bearing heavy loads. Easy to install and operate, our range of Powered Roller Conveyor has become the favored choice of clients. Precisely manufactured, our range is made available in the market at cost effective prices. 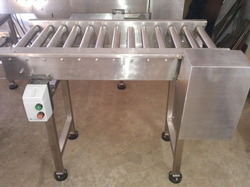 Looking for Material Handling Conveyors ?